That Mosfet's toast. Most definitely the cause. Repair or replace. I'm having trouble printing objects with holes in them, slicer says they aren't manifold even though they do have an "inside" surface of the hole. to try and get around this I upload to the Microsoft azure website that its suggests and I am able to repair and download it as a 3D object type file not as an STL file. I though I would be able to get around this by opening the 3D object file with the 3D builder app and then save as an STL file, but that gives me a message saying that not all of the fixes made will be transferred (or something similar) and when I slice it all of the holes are filled in. The object looks completely fine on the 3D builder app, but I haven't figured out a way to add my printer to that app. Does anyone know a way around this problem? Or how to add my printer to the 3D builder app so I can just print from there? Has anyone added a second hot end/extruder to the x carriage? I am wanting to add a second mk8/9 and was wondering if anyone has tried this and what mounting procedure they used. My RepRap Guru i3 Printer five months later. 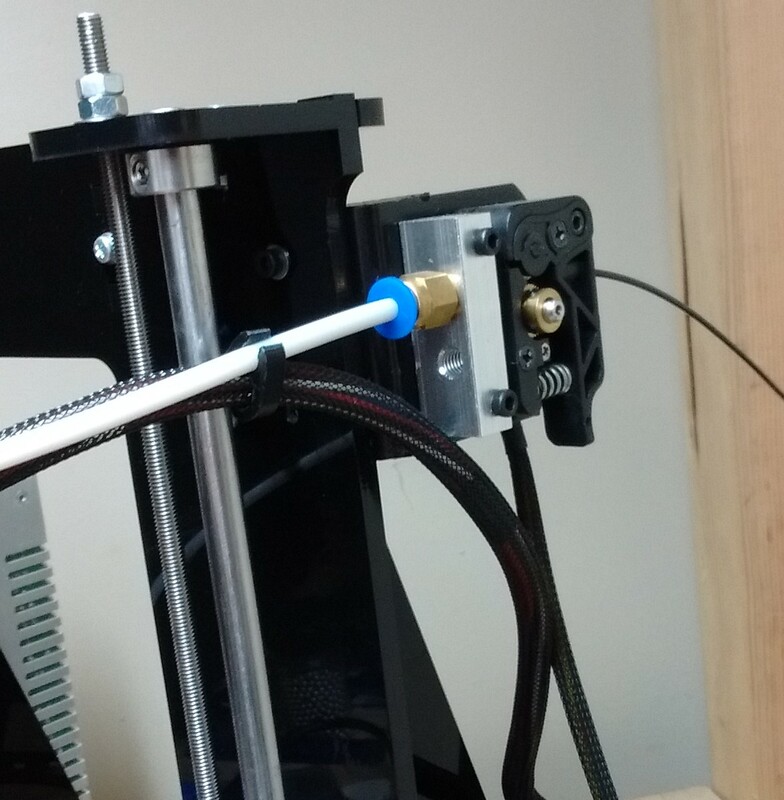 You can use the MK7 Extruder with a Bowden setup. You just need to buy / print a 90 degree bracket to mount the stepper motor. Sorry for the crummy pics, they were full size but I had to crop them due to the 614.4 KB size limit. Below is an email describing x-axis rod length issue (fixed) and my current issue of my extruder motor not working. Figured I'd post it here in case it can help others (or if anyone has insight into my current issue). Thanks for the quick feedback last week. I had contacted you about the x-axis rods being too long and you responded that it may be slag in the holes. It was (motor side, idler side was clear). 2 minutes with a drill bit and the rest of the build went as smooth as could be expected! This was a much better option than what I have seen others do (cutting the rods down). • The motor itself works fine. I swapped the connector with the x-axis motor’s connector and using Repetier I can move the motor in both directions as the x-axis motor. • I can manually (not Repetier manually, hand and finger manually) extrude PLA by pushing it through. Could it be a bad RAMPS board? Is there a way I can configure Repetier to use ext1 as Extruder 1 (software has extruder 1 and 2, RAMPS / Firmware use ext 0 and 1) without firmware change? If firmware change, I’m assuming changes to pins.h (is there a simpler way in configuration.h)? I can't claim any credit for this one if it solves the problem as someone else posted it earlier tonight. Use the printer menu (if it has one) to look at configuration, or send it an M503 command from Repetier Host and check the steps/mm setting of the extruder. Someone found that theirs was set to zero, and of course the extruder wouldn't feed. Hey Supermec.. Thanks for the lead, but it turned out that this isn't the issue. It looks like steps/mm is okay. BUT, I am going to remove all configuration and start over - so maybe that will help (maybe it is displaying a value it isn't using?). My first suggestion would be to replace the acrylic heat bed with something that does not warp. my printer is useless until i build a bed for it. I had the same problem. I seemed to occur after I started printing with PETG and was heating the bed to 95C. It looks like this is a common issue with all I3 type printers. I recently bought a Reprap Champion aluminum Y-axis carriage with aluminum bearing housings to try to correct this. In order to use this, I did have to trim some of the frame though. The warping is gone and it seems like I'm spending less time levelling my bed as well. Does anyone know why my prints would print different levels or rows or whatever then shift over like 1/2 inch. the printer will print 10 rows or so then shift, it is random in the shifting. so far i have about 30 pieces of scrap plastic i am willing to sell to the highest bidder basically i am not getting anything useful from my printer. can anyone offer any advice? I reloaded the Mega programming 3 times to make sure it was loading successfully. I built a prusa i3 kit, and it has worked fine with small prints, but if I try to make a larger print, the corners and bottom will start to warp. I have made sure that the bed is level and the extruder is the right distance away from the bed. I have also changed the temperature of the bed. What are some things I could try to fix my warping issue? I think this is caused by upper layers (like layers 10 through 20, say) cooling and shrinking, pulling up the lower layers with them. So turning up the heated bed doesn't really help. I imagine heating the whole thing would help (e.g. put the printer in a warm box), but the easiest thing to do is to print with a brim or a raft. The corners still peel up, but you don't care because you throw them away when you're done. Of course you need good adhesion to the bed. If you're printing on glass or plastic make sure it's clean--oils from your hands can really mess it up--use some rubbing alcohol and scrub it, then don't touch it before printing. Or use blue tape, and don't touch it either. For reference, I print on a sheet of PEI plastic (taped to the glass bed) at 100C for ABS, and generally on a cold bed for PLA. I print my first layer at 150% height, 200% width, and 50% speed. What percentage infill are you printing with? Generally, unless you need massive mechanical strength, there is absolutely no need to print with 100% infill. 25% or even 20% will do without greatly reducing the strength of the finished print. The more cooling filament there is in the upper layers, the higher will be the force trying to warp the print off the bed. I just finished building the Prusa i3 and installing software and firmware. I am attempting to configure the printer but have run into some problems. In manual control, no matter what buttons I push, the motors will not turn. I cannot change the position on any axis. I have been able to get the heated bed to heat up, but I have not gotten the extruder to warm up above 20 degrees C. All the wires are connected between the ramps board and the stepper motors/end stops. I can't seem to locate the problem. Does anyone have any advice? 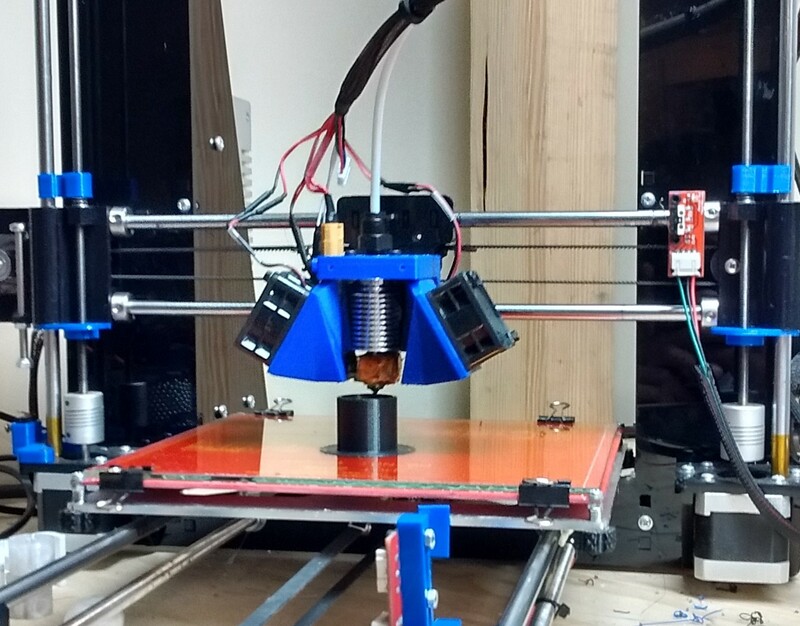 I've been having a couple problems with my RepRap Guru Prusa i3 v2 3D printer. 1.) I'm having trouble homing the X, Y, and Z axis, as the bed and hot move to opposite end of the printer that the endstops are on. It then starts to grind in the belts, and I have to unplug it. 2.) After trying to home the bed, and having it grind, I tried reversing the polarity of the stepper motor on the RAMPS board (which the instructions manual said was fine to do), and then ALL of the stepper motors wouldn't work with manual control. 3.) The RAMPS board flashing light isn't on anymore after problem 2 either, and I'm not sure how to fix it. 4.) The computer wouldn't connect to the printer and said the COM3 (my Arduino board) wouldn't let the computer connect. I tried using the RH server, and that worked for a little bit, until problem two happened. So far, besides these problems, I've had a lot of problems with this printer: bearings were junk (bought IGUS Drylin bearings to replace them), the steel rods are mild, the injection molded parts on the Z carriage were junk too, and the instruction manual has holes in it. I would really appreciate advice on fixing these problems, as I don't want to throw 300$ down the drain. I figured out the problem from a different reply. I thought, and I am embarrassed to say this, the stepper motor was reversed (homing issue), so I unplugged it from the machine and turned it around. But here's the catch: I did it while the machine was on, so I fried the stepper drivers. The homing issue was that it was set to min. for homing, not max., which takes the X and Y axis to the end-stops. just curious, the only instructions on the website appear to be for the i3 v1, not the v2, i havent bought it yet, and i am curious, are the instructions the same? do instructions ship withe the printer? what about that bit with the RAMPS and adruino breaking because of the flaw in marlin while using the LCD? and can you print directly onto the glass, or do you need tape? Edited 1 time(s). Last edit at 01/17/2017 08:08PM by ajlewis3008. Beginner here, I just finished setting up my i3 a few days ago. After configuring everything in Repetier Host in accordance with the RepRap Guru configuration guide, I tried to print a simple Lego brick, but no PLA was extruded. I cancelled the print and tried using the manual controls for the extruder, which seems to work fine, although it doesn't always extrude the correct amount of filament. During the print, the extrusion motor makes a clicking sound as if it were jammed. I have tried to print multiple times, all with the same result. What am I doing wrong? ajlewis3008: When you buy the kit, they give you the link to a Google Drive that has the v2 instructions manual. The v2 has updated instructions. A slip of paper with the link is actually found in the box first thing when you open it. If you end up buying the kit, have fun! Edited 1 time(s). Last edit at 01/23/2017 01:45PM by Tyborg. If you're able to extrude manually but not while attempting to print, then the issue might be a blocked nozzle due to its being pushed down too hard against the bed. Mind you, I'm new to 3D printing myself, so always take my suggestions or ideas with a pinch of salt. That being said, try adjusting the long & thin Z-axis bolt--the one that pushes down on the end-stop switch when homing--to raise the nozzle up off the bed a bit. Don't worry if you start extruding noodles haphazardly that don't stick to the bed--you could later on try fine-tuning the Z-axis home offset until the first layer begins to stick--your first priority is to ensure that the printer can extrude plastic when you need it to actually print. I've found that blue painter's tape helps a lot with getting that first layer to stick. If the clicking and inconsistent extrusion steps persist, come back and let us know, I might have an additional suggestion since I faced a similar issue that I managed to solve. will this Y plate work with reprapguru? Edited 1 time(s). Last edit at 01/25/2017 08:40AM by Todd Carr. New member to the forum. Bought mine right before Christmas and am about half way thru my 3rd roll of filament! Stuah - couple things to look at. Be sure that the extruder motor is pulling the filament and not pushing it back out. You may need to reverse the motor connector. Second thing is the set screw on gear on the motor. Mine came loose after quite a bit of printing. Has anybody been able to find an extruder cooling fan shroud that will work with this extruder? I had to get replacement shafts for the x axis as the shafts already have deep grooves in them. Waiting to order some IGUS bearings and an aluminum y chassis before I replace them. Pretty sure all of the shafts now have grooves in them from not being hardened. I have some Nema 17 motor dampers on order to help quite down the vibrations. I also have a PrintinZ print mat on the way so I will let everyone know how it turns out. I have been having a blast with this printer!! I also found and printed this rod guide/bearing keeper as one of my z rod bearings kept popping out of its hole - Prusa I3 Z axis top bearing holder. Works great! So, I fixed the stepper drivers. All of the axis move, but when I go to print, 2 things happen: The X and Y axis don't go all the way to the edge of the 200*200 MM bed, even though the settings show that the bed is that size. I checked the voltage to make sure that the stepper were simply getting enough voltage. Second, the heated bed doesn't turn on at all. ideas? Edited 2 time(s). Last edit at 01/28/2017 03:42PM by Tyborg.